It’s great to see a major eBook purveyor recognize that some of the most voracious readers these days are consuming content in other languages. “eBooks Kindle en Español” will offer a range of titles, from native Spanish-speaking authors to children’s books, plus translations of bestsellers, like The Hunger Games and Steve Jobs’ biography. Indie writers can also publish their works in Spanish (details below). To check out the store’s offerings, hit up this link or to learn more, click the “Show Press Release” button at the bottom. Amazon.com Introduces eBooks Kindle en Español, a Kindle Store with the Largest Selection of Spanish-Language Bestsellers Available Anywhere in the U.S.
SEATTLE, WA – April 5, 2012 – (NASDAQ: AMZN) – Amazon.com, Inc. today announced a new Spanish-language eBook store within the Amazon.com Kindle Store, “eBooks Kindle en Español” (www.amazon.com/tiendakindle ), along with additional features specially implemented for U.S. Spanish-speaking customers like extensive help pages, and phone and email customer support in Spanish. U.S. customers can now shop for Spanish-language books in the new store on Amazon.com, or set any Kindle device to access a customized shopping experience designed for books in Spanish. eBooks Kindle en Español offers customers the most Spanish-language bestsellers, as measured by Nielsen, including “El Alquimista” by Paulo Coelho, “Cien años de soledad” by Gabriel García Márquez and “Juegos del Hambre” by Suzanne Collins. The store has over 30,000 titles in total, including the exclusive nonfiction work, “El Libro de los Manuales,” from iconic Brazilian author Paulo Coelho, the best-selling Spanish-language author of all time on Amazon.com. The store also includes books from Nobel Prize winners Gabriel García Márquez, Camilo Jose Cela and Mario Vargas Llosa, popular titles from best-selling authors such as Julia Navarro, Carlos Ruiz Zafón and Isabel Allende, over a thousand free classics in Spanish, and exclusive Kindle Singles in Spanish. In addition to the new Spanish-language eBook store, the new $79 Kindle and many free Kindle reading apps can be easily customized for complete Spanish-language reading and navigation, including popular highlights and other social features. “Humankind needs stories the way it needs oxygen and the impact of ebooks is formidable and is transforming the entire book industry, as well as readers,” said internationally best-selling author Isabel Allende. 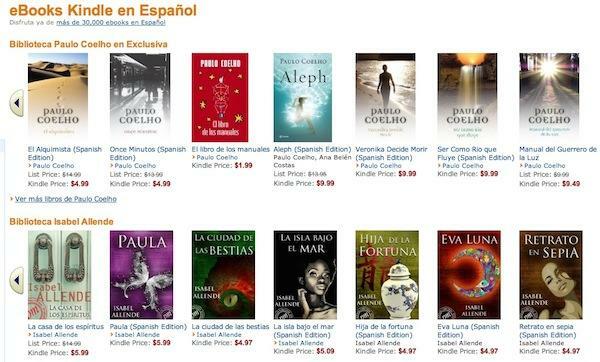 Independent authors and publishers can also use the KDP website (http://kdp.amazon.com) and select “Spanish” to make their books available in the eBooks Kindle en Español store, as well as more than 100 countries worldwide, while continuing to own the rights to their books. Kindle books are “Buy Once, Read Everywhere” with free Kindle reading apps available for the most popular devices and platforms, including iPad, iPod touch, iPhone, PC, Mac and Android-based devices. Amazon Whispersync automatically syncs your place across all devices, so you can pick up reading where you left off. Plus, with Kindle Worry-Free Archive, books you purchase from the Kindle Store, and any notes or annotations you create, are automatically backed up online in your Kindle library on Amazon.com where they can be re-downloaded wirelessly for free, anytime.